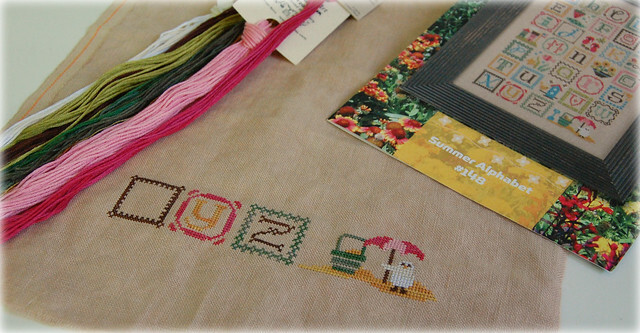 Nicole's Needlework: Lizzie Kate "Summer Alphabet"
Lizzie Kate "Summer Alphabet", a photo by Nicole's Needlework on Flickr. I picked this pattern up at a shop in Florida. I thought it was so cute and a change from the repros I've been stitching. I'm getting sooo close to being finished with Sarah. I hope to finish her sometime this week!! 40 ct. Vintage Meadow Rue, various cotton over-dyed threads (1 over 2). Very cute and you're right it will be a very nice change. Enjoy! Really cute and the colors are nice and sunshiny! That is a cute start and you will have it done in no time! Looking forward to seeing the finish on Sarah. Hope you have a nice visit in FL. Glad you made it back safely... your new pic is just too cute! Such a cute and colorful design! Shouldn't take long to complete! I agree--totally cute. I'd have bought it too! That's really cute!! I can see how it would be a nice break from stitching something like Sarah. I can't wait to see her though! It really is cute! I have to admit I don't remember seeing this one. I love the colors! Sweet... love the bright colors. That's a big change from the reproductions! Such bright and beautiful colors! Have fun stitching it! I checked every day to see if you posted something...anyho, hope you have a nice Easter vacation. You picked up some fun things in FL. Good for you! Your profile photo is adorable !! This is such a cute pattern Nicole...I have been eyeing it also...Glad you are back home and I know you had a blast over spring break!! Fun start! I just love the colors! I love those colors and of course, I love Lizzie Kate!!! Cute, cute, cute! Those colors are so bright and cheery! Cute pattern, and I am liking the new blog look. oh I love your stitching ! This is a really cute and colourful design! Very cute and just what you need to keep you in the mood for summer and the nice sunny days. Need a break once in a while, but your break is another's big project! Pretty colors, too!